Bright sunshine and way-warm temperatures this early Monday evening on California’s north coast — even now we’re supposedly in the high-60s, and more is scheduled for tomorrow. We’re in a good-weather zone, and from all indications, will stay in such a condition for at least the next couple of weeks. 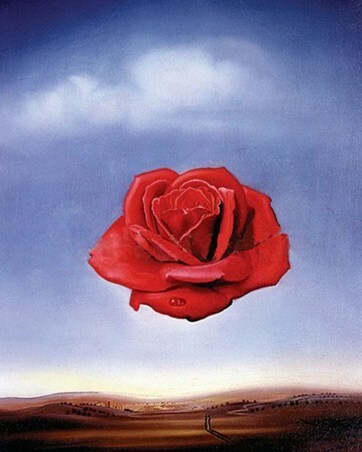 (Illustration: Salvador Dali’s ‘Meditative Rose,’ found here). This afternoon was the nicest episode weather-wise this year. I took Kuru for her daily PM sojourn, and although at first it appeared maybe a nippy, wet fog bank was starting to roll in from the chilled ocean, the warmth/whatever prevailed, and the entire walk was really nice. Already a lot of green everywhere — open fields, yards and even growing up through cracks in asphalt, grass/weeds/bushes are sprouting in a flourish. Despite the winter, this up-shoot — reportedly, fires have already burned nearly 10 times as much area in California this year in the same period of 2016. And for sure, satire the real-route to relief — an uplift, funny read at The New Yorker this morning on the publishing of about seven hundred pages of Trump-related documents “leaked” to the Onion. Among the leaked Trump documents: a string of e-mails between the President and Boeing’s C.E.O., about Trump’s desired upgrades — marble everything — to Air Force One; some of the Vice-President’s handwritten notes, with helpful illustrations, describing puritanical inventions of his, like a “nose harness” to prevent the smelling of “sinful smells,” like a woman’s skin, and a “blouse that cannot flutter in the wind”; and three of the President’s idiosyncratic daily briefings, written on children’s placemats. “Like you get at Denny’s,” Bolton said. There are Mad Libs-style executive orders (“fill-in a ‘fear-inducing noun,’” one instructs, then an “adjective that implies ‘sub-human’ without actually stating it”), a note from Obama to Trump that was left in the Oval Office, as well as handwritten letters between Melania Trump and her concerned relatives back in Slovenia.